The Quarter Dog Pose brings a gentle stimulation of your Lung Meridian, to open your chest for better breathing. The body-mind techniques I describe below, will greatly enhance your healing if you have asthma, allergies, sinus issues and other respiratory conditions! Students of yoga may not be familiar with Yin Yoga's Quarter Dog Pose name. Yet I am sure most yoga practitioners have heard of and/or practiced the Puppy Dog Pose. They are essentially the same poses, in all appearances. Some schools also call this pose the Half Dog or the Melting Heart. However, if you have been reading about Yin Yoga on this website, you know that the difference between a Yin pose and a Yang pose is how you practice it. 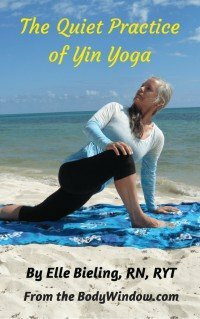 Yang Yoga engages the muscles for an active and athletic participation in the yoga poses. Yin Yoga releases the muscles and works deeper into the joints, tendons and ligaments. In this process, one observes what happens when you remain still, hold the pose for a long period of time and play your physical edges. Yin Yoga is mindfulness practice within the yogic asana. What could be more beneficial to you, your body and your state of awareness? Plus each and every yin yoga pose has incredible therapeutic value as you place pressure on a particular meridian as described in Chinese Medicine. This is a practice of mindful self-acupressure. Any stress placed on the joints, as Bernie Clarke states above, must be sufficient to bring the benefits of change through increased range of motion, flexibility and increased fluid in the joints. Yet, if the stress is too great, you can damage the yin tissues. Finding just the right edge to bring the therapeutic value to you, is paramount in your Yin Yoga practice. To begin the Quarter Dog Pose, begin on all fours, in the Table Top Pose (or from the Child's Pose). Align your hips to be stacked directly above your knees. Lower your upper body towards the ground, until your elbows are on the ground. Test your body here. If your back, shoulders and knees feel safe, stretch out your right arm over your head, and bend the left to make a frame for your forehead, as shown in the picture below. You can play with your head position for what feels best to you. You may try placing your forehead on your lower arm, or place your head above or below your arm. You may even see if resting your chin on the ground makes sense, if your neck and shoulders are very open. If your knees hurt, you may place a blanket under them for padding. If your shoulders hurt in the lower position, go back up to your elbows and rest there to see if your shoulders will feel safe. If you feel safe in the lower position, meaning you have no more than a mild sensation of pulling or tugging anywhere, you are at your first edge. Now, allow your belly and armpits to release and drape towards the ground, creating an arch in your lower back, like the "cow" position of Cat/Cow Pose. If your shoulders become sensitive to this pose, you can place your head on a cushion, so it is higher and takes some of the edge off your shoulders. Hold the pose for 3-5 minutes, or longer if you wish. To come out of the pose, inhale and push up to all fours again, in the Table Top Pose. You can arch your back up like the Cat in the Cat/Cow Pose, as a counter pose to equilibrate your body after this pose. Don't forget to repeat the pose on the other side, for and equal amount of time, with the left arm outstretched to keep your body balanced. While you are in the Quarter Dog Pose, practice mindfulness techniques like conscious breathing. If you stay aware of what is arising in you while you remain still and present to your body, this is mindfulness. Resist the urge to fidget. Notice what is happening, or even what is NOT happening. Are you holding feelings in, or are you feeling weepy? What happens when your internal method is one of deeply belly breathing, when you allow yourself the deep therapeutic experience of drawing in energy and yes, self-love, just for you? What happens when you are still and just notice all your sensations? In addition to mindfulness through increasing your awareness of yourself and your body, the Quarter Dog Pose stimulates your Lung Meridian, as defined by the Chinese Medicine system. This pose, with the outstretched arm and mildly arched back, supplies gentle opening and pressure to the front of the chest, the side body and entire chest area, as well as the shoulders resulting in a sort-of self-acupressure. By applying pressure to this part of the chest and shoulders, you are internally stimulating the lungs. This opening leads to better breathing, stimulating and strengthening your Lung Chi (or energy) for a reduction of colds, sinus, asthma symptoms and other problems involving the respiratory tract. All of these mindful, body-mind therapeutic techniques, especially if you have asthma, sinus problems and other respiratory conditions, are incredibly useful for your healing process. You may also be interested in this pose, with an added twist, to add to the therapeutic effect. Click here to see the Quarter Dog Pose with a Twist, and a suggested Yin/Yang Dog Pose Sequence! May you discover the joys of Yin Yoga, as I have. May you travel inward, with your home practice. It is my personal belief, that while yoga classes are marvelous to start you on your journey, and provide a community, you will never really deepen your practice, until you experience your own personal, home practice. May the Quarter Dog Pose, strengthen your Lung Chi Energy and may you find healing of your own personal respiratory issues, and heal your body, your mind and your soul! Invite your body to be part of your soul's experience, with this yin practice. Namaste!